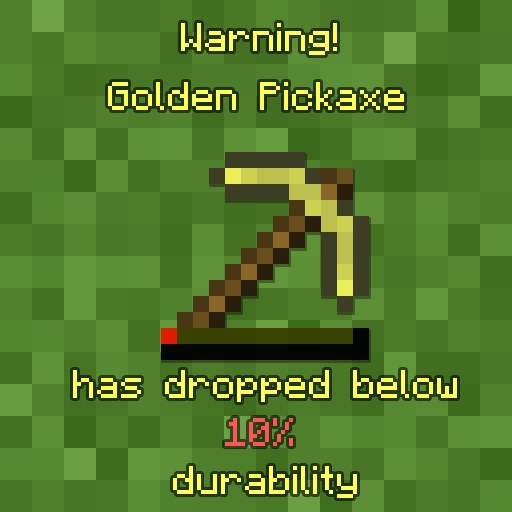 Durability Notifier is a small client-side mod that uses various methods to notify the player when there tool is low on durability. It uses subtle methods like using sound or potion effects and is fully configurable via the in-game configuration menu for ease. So, you can configure the mod how you like it. For more information on what settings are available see the detailed explanation for the configuration below. The mod tries to stay as vanilla server friendly as possible. The only feature that doesn't work while connected to a vanilla server is the GiveFatigue feature. soundlocation - specifies the soundlocation of the sound that "PlaySound" will play. If the sound location inserted is false it will say so in the log. Where do you make the configurations? Would it be possible to add a blacklist and/or whitelist to this (for wood tools for example)? Also could you rename your files so we know which version of the mod we downloaded? What does the 1.13 version support? Rift, Forge, Liteloader or a Vanilla profile method like I know is now a thing thanks to Bounding Box Outline Reloaded. I assume Forge but just thought I'd ask to me clear on it. Could there be a config option to have the sound & message play only once when you first hit the durability threshold? To ensure that you won't miss it... the message could have a config option to stay on-screen for a certain amount of ticks/seconds... like 5 seconds or so. It currently stays up for a total of 3 seconds. Also is it just me or is the SentMessageColor section in the in-game config glitched in a way? It shows up blank for me and it's a fresh config file. Will this work with modded items? For example... Tinker's Tools or items that uses energy instead of durability? Just woke up, sorry for the late reply. I am using the MC 1.12.2 version. Does this work with armour as well? Hey awesome mod, but is there a way to translate the message shown on screen? Currently there isn't. But I'll make sure to make it configurable in next version. I can do it in multiple ways. 1) Make it depend on the Lang file. That way if people create lang files for the mod they can be added and will automatically translate. 2) Make it configurable in the mod's config. EDIT: I decided to make it the lang way. I would like to know what language you'd like to translate it to. (anything behind the = not in front) Then I can add it to the mod. The 1.12 file says it cannot work in 1.12 and needs 1.11. Is the wrong file uplaoded, or is it bugged?